On a leisurely bicycle ride this past Sunday, I passed under the railroad tracks on West Vernor Highway next to Detroit’s Historic Michigan Central Station, as I have many times. As I pedaled up the incline approaching Roosevelt Park in front of the station, I couldn’t believe what I saw in front of me. 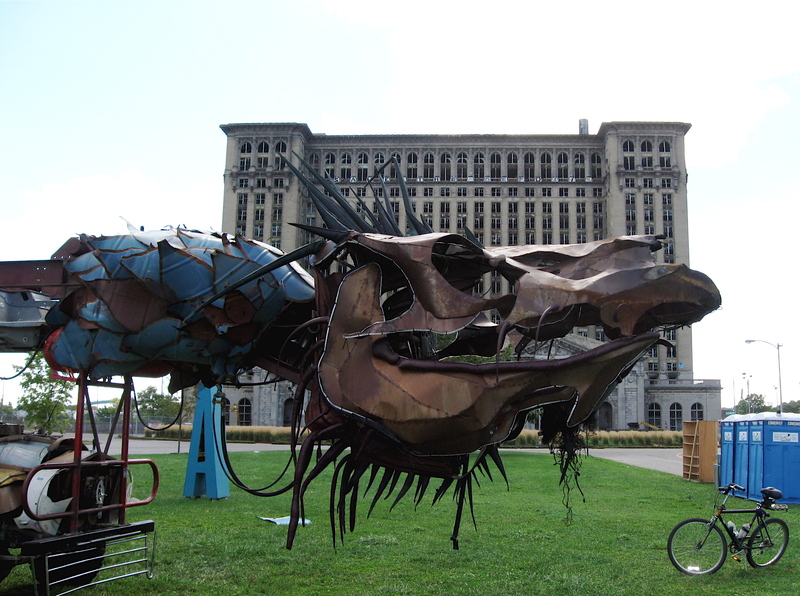 There was a giant mechanical contraption fashioned in the form of a dragon. The monster wasn’t a sculpture placed in the park, but a sculpture of sorts, constructed and mounted on the frame of a truck. It was positioned in the middle of the park! The unusual creation, named Gon KiRin or “Light Dragon”, is a one-year creation of Ryan Doyle and Teddy Lo. Built on the frame of a 1963 Dodge truck, the mammoth, mobile dragon has its roots in California where it was hand-built for the Annual Burning Man Festival held in the desert of Nevada. From what co-owner Doyle told me in a brief conversation, it was shipped here to Detroit over the past winter and is currently stored in a large, unassuming warehouse sized studio near the Russell Industrial Center where it is maintained and updated. 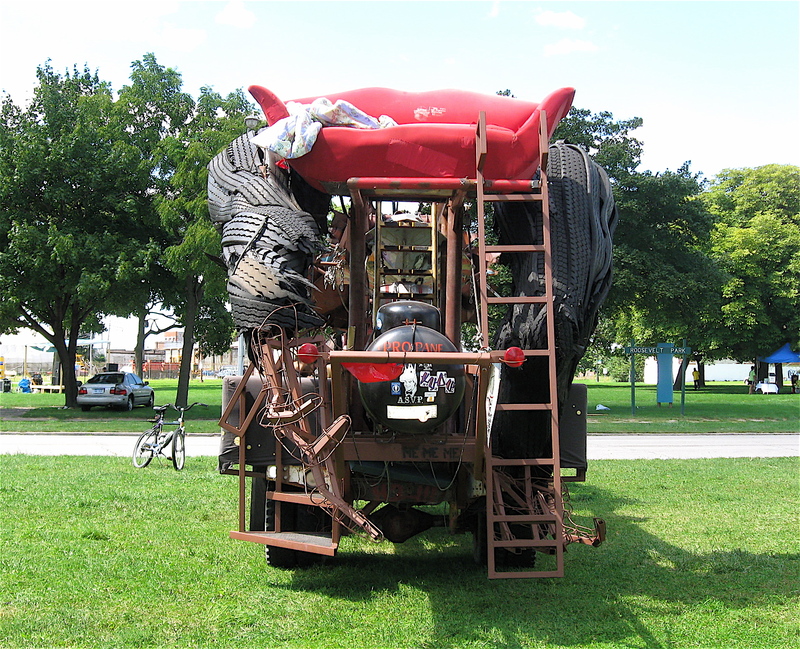 The creative invention seats about 20-people on various levels of the vehicle, including two couches mounted to the sides and one on the back of the rolling sculpture. 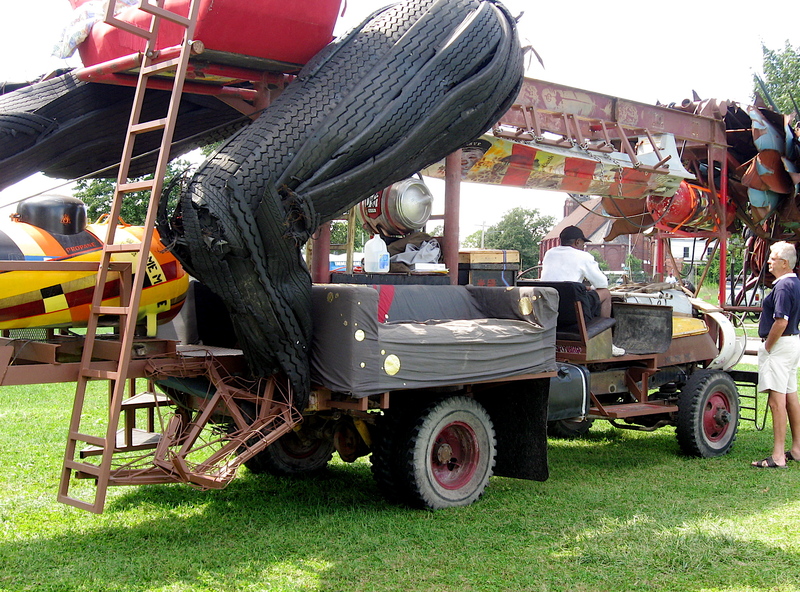 Two can also sit up front in the fire-breathing, hydraulic movable head. For entertainment needs, there’s even a DJ booth built into the framework. 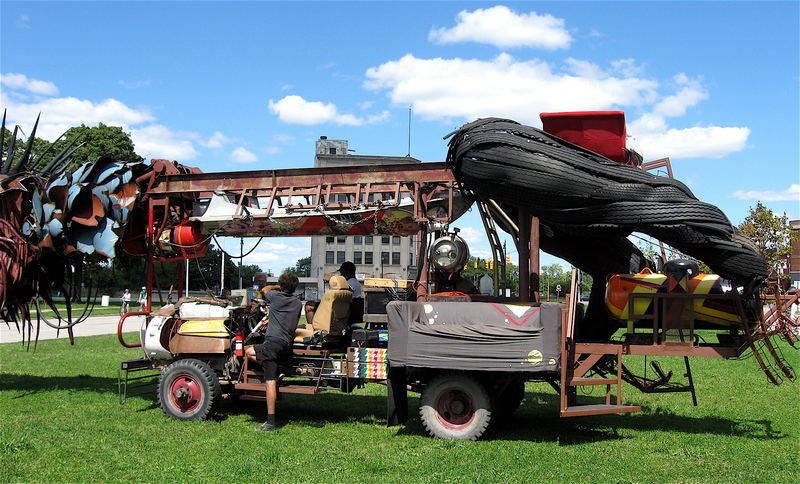 The kinetic sculpture on wheels was fashioned from discarded scraps of steel, cast off furniture, worn out tires and other unidentifiable found objects. This thing is a true, recycled machine. Unfortunately when I came across this unusual monster truck in the park, only two of the legs were attached, the upper vertebrae and the waving spike tail were not. I couldn’t imagine what this fully assembled dragon on four-wheels must look like in real life, when all the elements are in place. Based on this YouTube video of Gon KiRin in action, I can probably guess. So what’s next for this unusual mechanical marvel? Well, according to Doyle, it will be shipped to New York and once there, it will be driven in a variety of upcoming festivals. 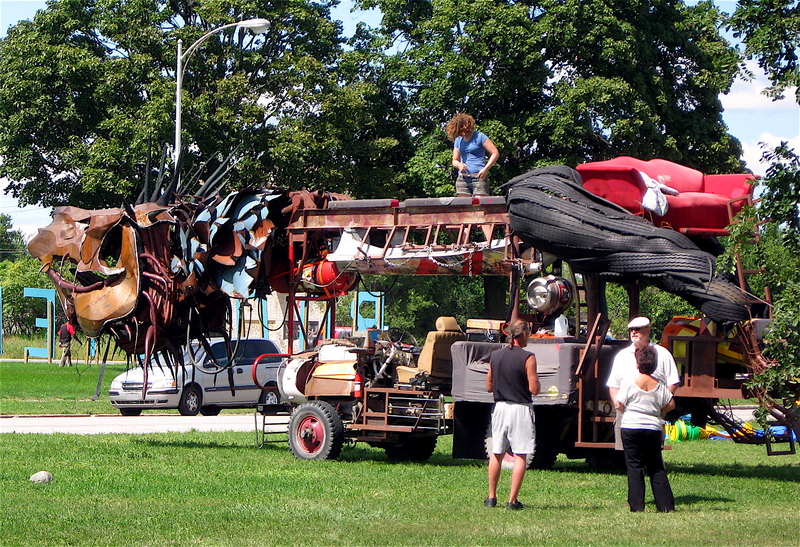 In the meantime, keep an eye out for the fire-breathing, mechanical dragon. It may come creeping by when least expected. Timbuktu is a small, powerful, well-written story that tackles many issues facing us. Those issues include homelessness in America, companionship, human cruelties, loneliness and how a major loss, such as death, can have devastating effects on us and others around us. It’s an interesting story told through the eyes and mind of a dog by the name of Mr. Bones. The dog is a sidekick and sole-mate to Willy G. Christmas. He’s a brilliant schizophrenic, homeless man from Brooklyn who spent most of his life wandering the streets, writing reams of stories, poetry, and essays that he stashed in a bus station locker. Willy is dying, and he and Mr. Bones travel from Brooklyn to Baltimore in search of his former high school English teacher who encouraged him as a young writer. Willy hopes to find a home for both his manuscripts and more importantly, Mr. Bones. Once in Baltimore, Willy dies and Mr. Bones must now fend for himself to survive the tough streets of Baltimore and beyond. Because of his trusting nature, things quickly go from bad to worse as Mr. Bones is presented with a series of rejections, disappointments and betrayals as he struggles to find food and shelter, something always provided to him by Willy. In his sad, lonely travels for survival, there is some hope, infrequent kindness and occasional comforts. However, constant unsettledness haunts Mr. Bones as he envisions being reunited with Willy in Timbuktu, their make-believe heaven, even while living comfortably with a well-to-do family. I found Timbuktu to be a thought-provoking story. 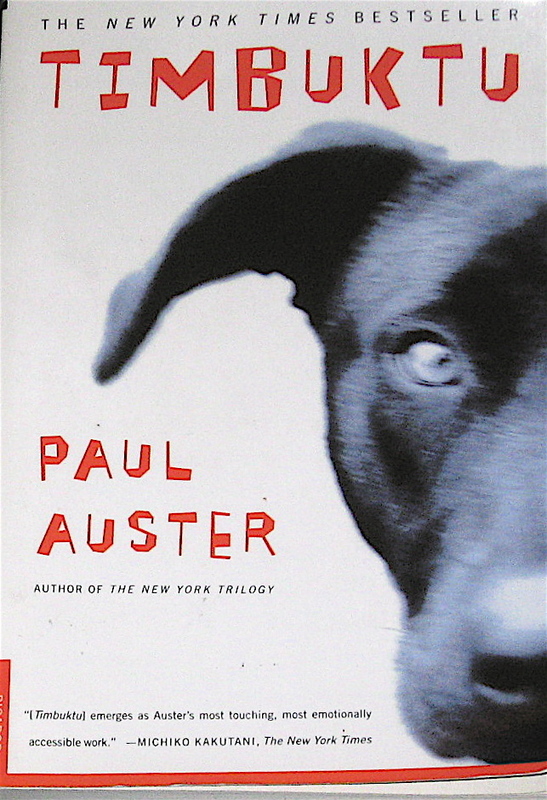 Auster’s writing style and his insight into the mind of the dog was realistic and never lost. Reading this little gem of a story, I could clearly visualize what both Willy and Mr. Bones saw and experienced in their homeless travels. The crisp, minimalist writing style allowed me to virtually feel their thoughts and understand the bewilderment of their unsettled lives. This was especially true with the dog, as the author vividly described how the animal clearly understood what the people were saying and doing around him, yet could not communicate what was on his mind. A perfect metaphor, I believe, for the homeless population of the world who are basically voiceless and ignored. I didn’t see this enjoyable story as being a dog book or an adventure story. I read it as a remarkable story of togetherness, companionship and happiness that quickly fades to prejudice, cruelty, sorrow and loneliness, not to mention the difficulties of being homeless. I would think most everyone in Southeast Michigan knows about the annual Woodward Avenue Dream Cruise. I’ve never been, but from what I’ve been told the event draws thousands of classic cars. I also understand car enthusiasts, numbering in the tens of thousands, line Woodward from around 9 Mile Road north to Pontiac, for a chance to breathe in exhaust fumes for hours as they check out the many vintage vehicles and 60’s muscle cars rolling by. There’s another Woodward cruise on the same weekend that starts at the riverfront and heads north to 8 Mile Road. It’s a different type of cruise, one that requires a little more individual muscle. 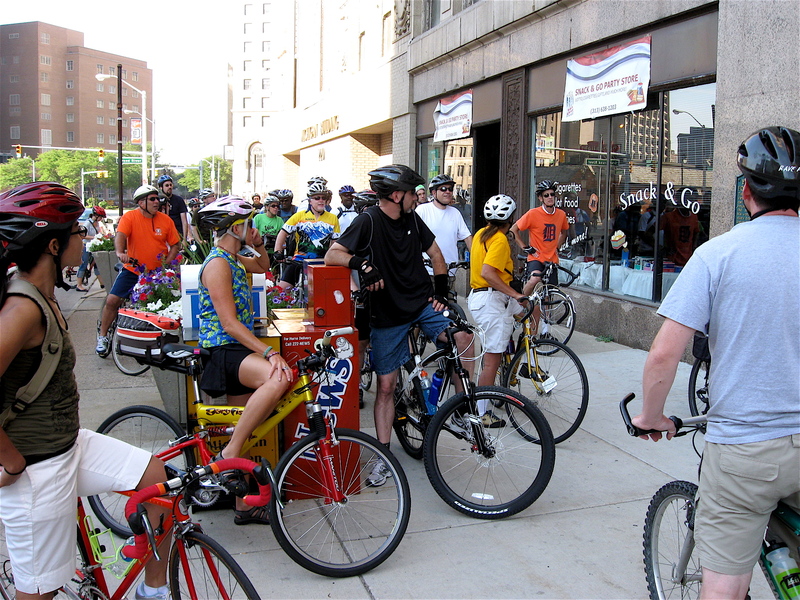 That one is the Annual Detroit Bikes Pedal Cruise. 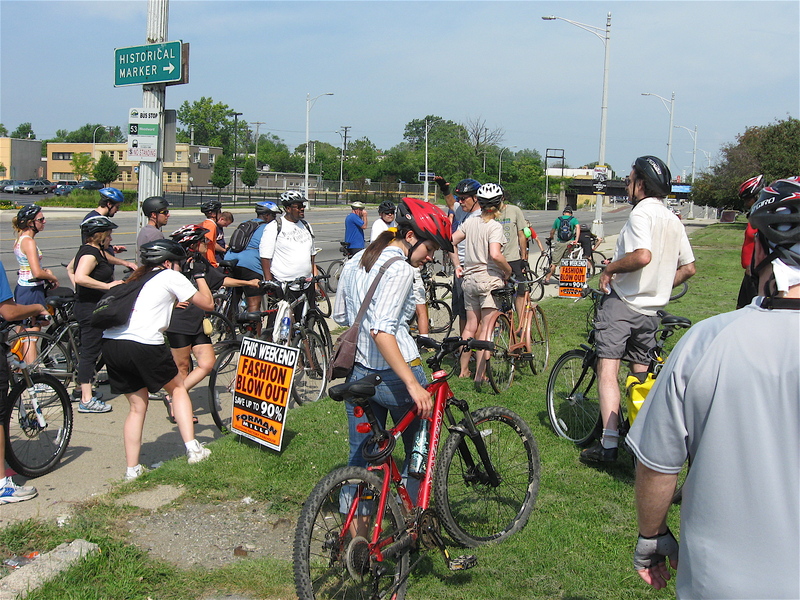 This past Saturday morning, about 80 bicyclists met near the Carousel on Detroit’s Riverwalk for an informative tour of the Woodward Corridor. 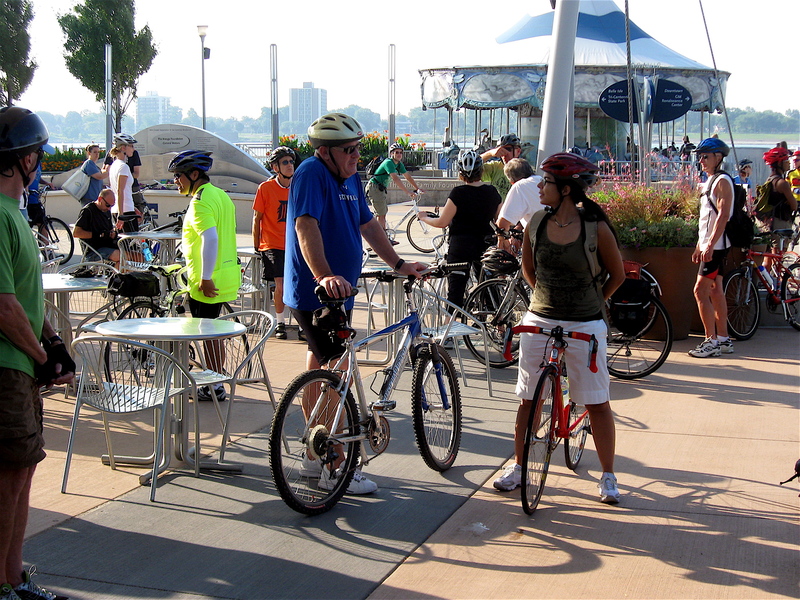 After a group photo was taken of the riders (posing in front of the Detroit River) our leader rounded up the cyclists and headed along the riverfront into downtown Detroit and beyond. He pointed out that Campus Martius Park, at the corner of Woodward and Michigan Avenues is the official, historic starting place of Woodward and from there it heads north eight miles to 8 Mile Road, thus its name. Our downtown route took us past various, clearly marked, automotive related sites before heading up the Avenue to mid-town Detroit. 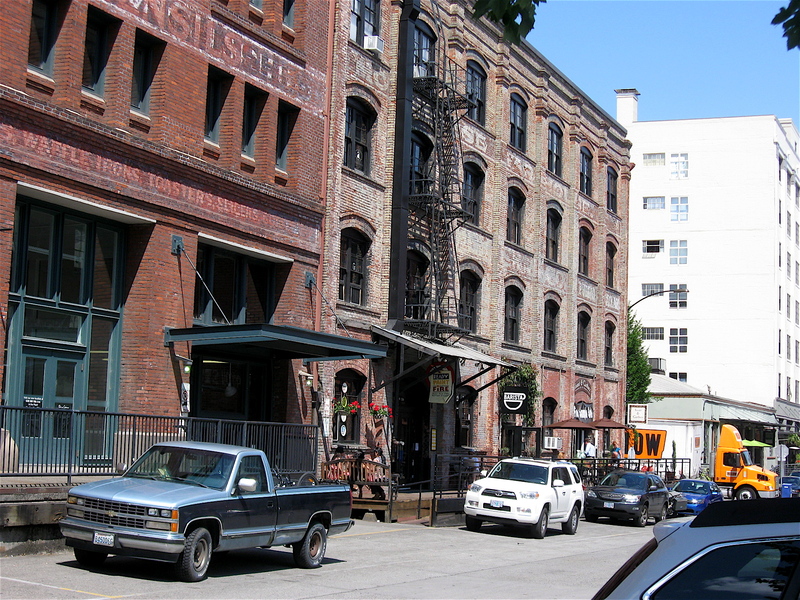 Once there, we pedaled west on Willis, that little bohemian street, to Second Avenue where the group stopped for a quick cup of coffee at the Thistle Coffee House. 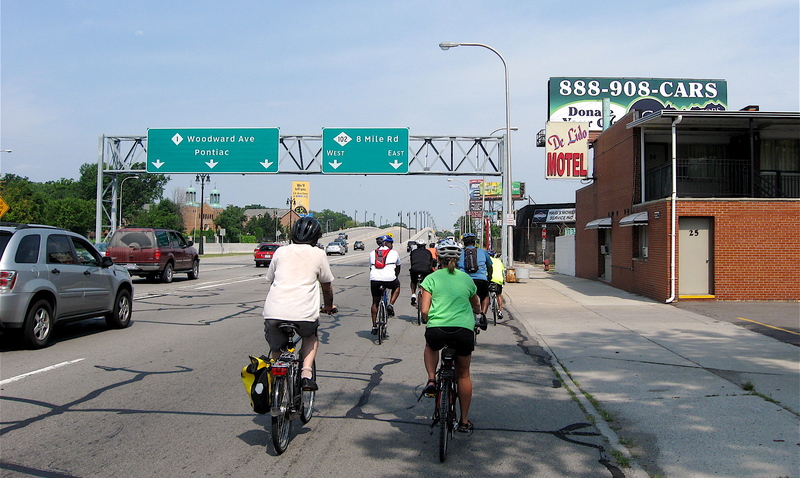 From there, our leader guided the riders to the historic Milwaukee Junction area, just east of the New Center. That industrial historic area was a major center of automobile manufacturing in the late 1800s through the early 1900s. 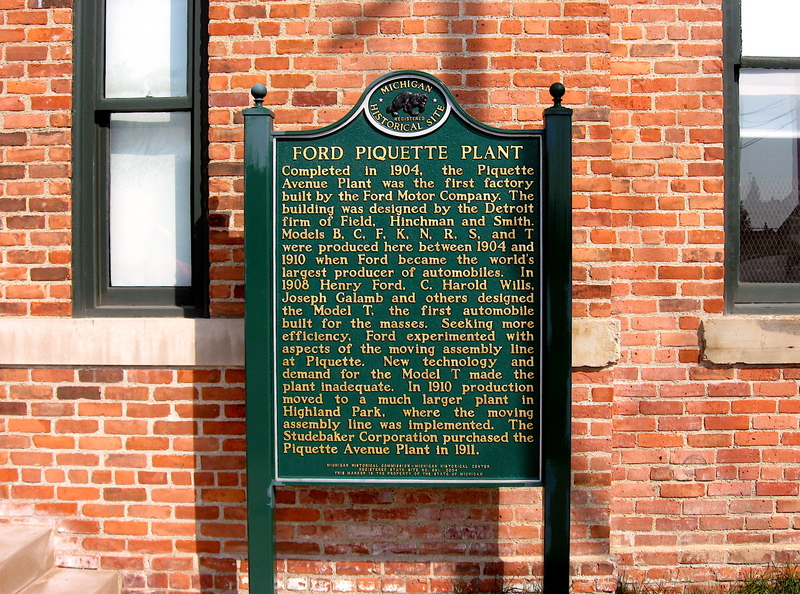 In fact, the Ford Piquette Plant is located there. It was the place where the first Ford Model T was built before it was mass-produced a little further up Woodward in Highland Park. Other visited sites along the bike tour route included a trip through the historic Boston-Edison Neighborhood to the Henry Ford Home, an Italian Renaissance style house on Edison Street. From there it was back to Woodward, then north to Highland Park for a quick stop at the original Ford mass production plant, the first automotive plant in the world with a moving assembly line. That factory, like many in Detroit at the height of the auto industry expansion, was designed by the famous architect Albert Kahn. A little further north we took a quick rest at the abandoned Michigan State Fair site before riding a half-mile further to 8 Mile, our destination. Once there, we looped over to southbound Woodward for the ride back. I’m not sure what sites or neighborhoods the leader pointed out on the return trip, because I cut out and rode State Fair Street to 7 Mile Road to my eastside home. That ride was quite a contrast to the Woodward Pedal Cruise; however, that’s a whole different story. In the first two entries of this series, I wrote about Portland, Oregon’s bike culture and the thousands of cyclists that take advantage of the city’s 350 miles of well-marked bike lanes. 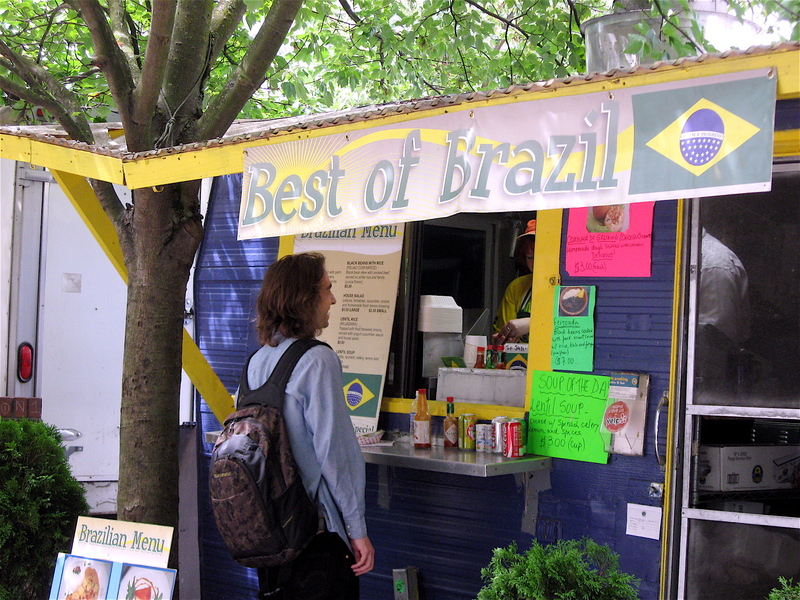 I followed that with an entry on the many food carts that sell savory dishes from all over the world at reasonable prices. I also wrote about the hundreds of microbreweries and lively neighborhoods full of small café’s, specialty markets, bakeries and independent coffee houses. 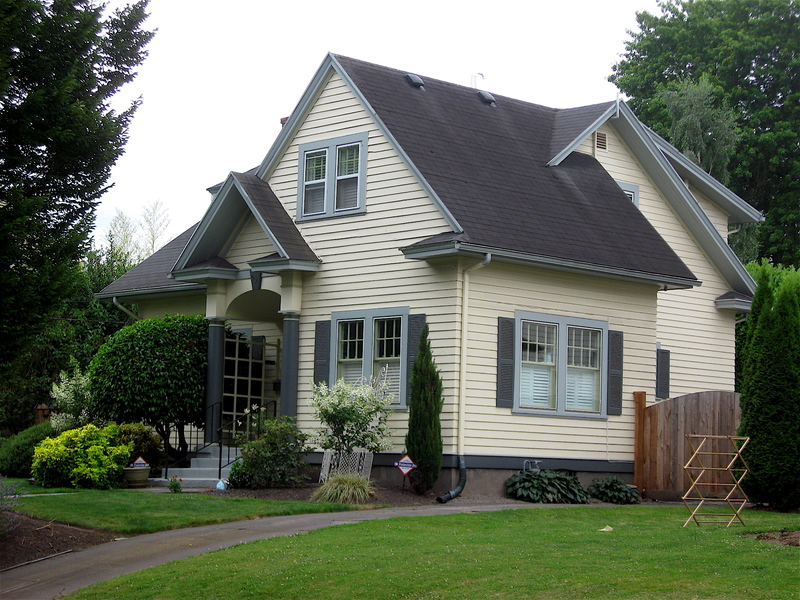 While cycling throughout the city neighborhoods, I was surprised and impressed to find that Portland has a large concentration of colorful, vintage Arts & Crafts style homes and other meticulously restored homes of the era. 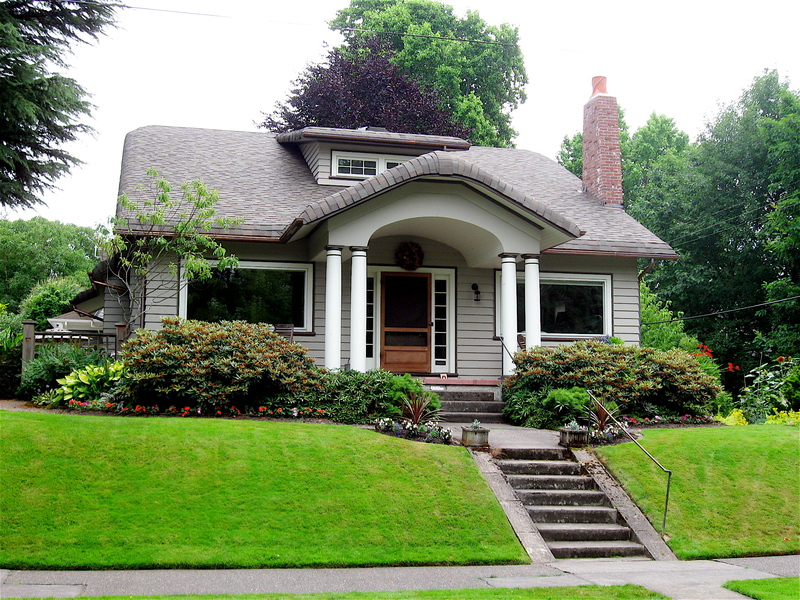 Most of the vintage 1920’s homes I saw were constructed from wood during the once booming lumber era, rather than brick like so many Detroit homes of the same period. 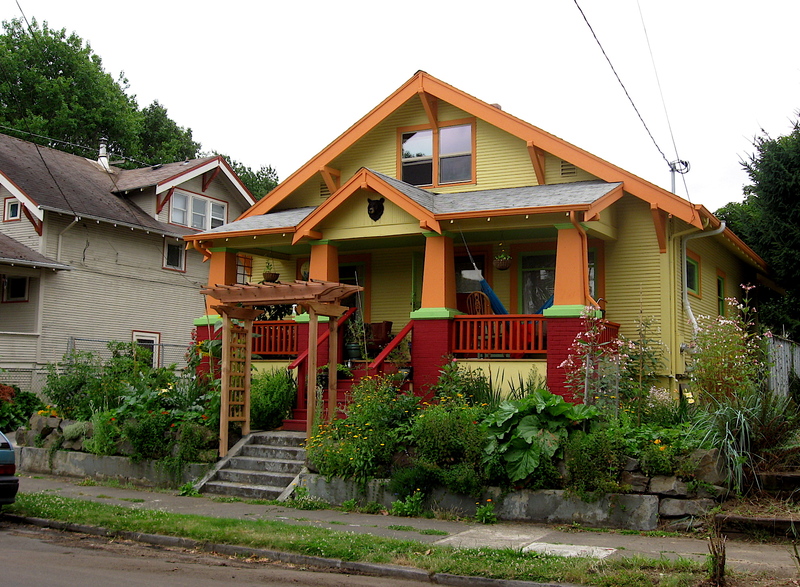 In this, the final entry on cycling in Portland, I offer a look at some of the beautiful homes and Historic neighborhoods. 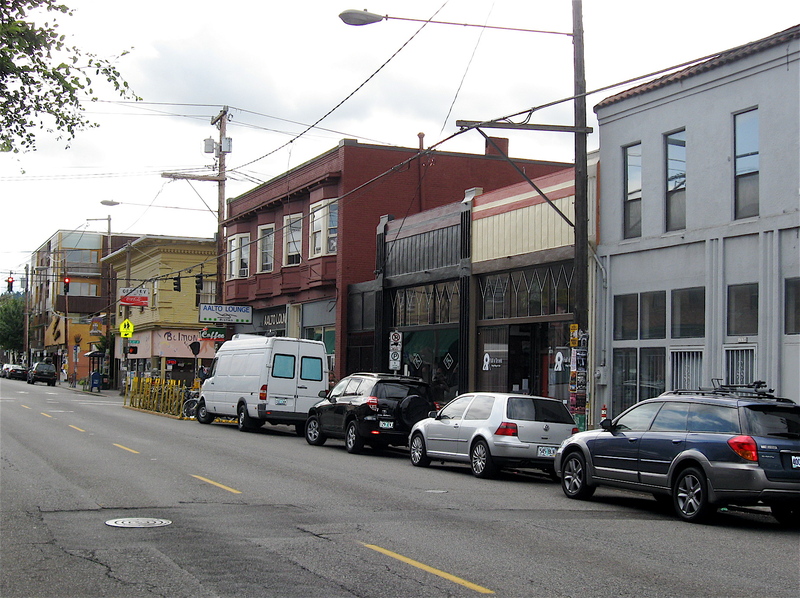 The Historic Irvington and Alameda sections are some of the city’s most exclusive. 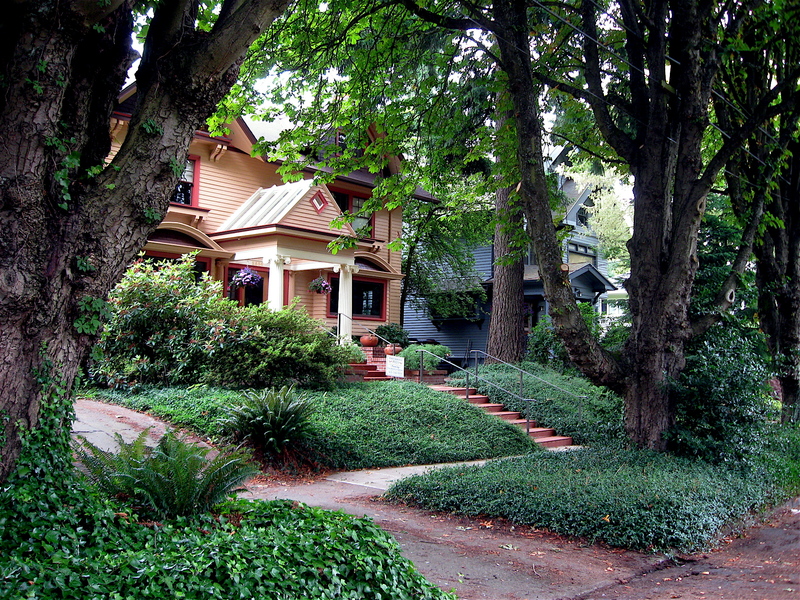 The tree-lined streets had some of the oldest and best restored turn of the century homes found in the city. 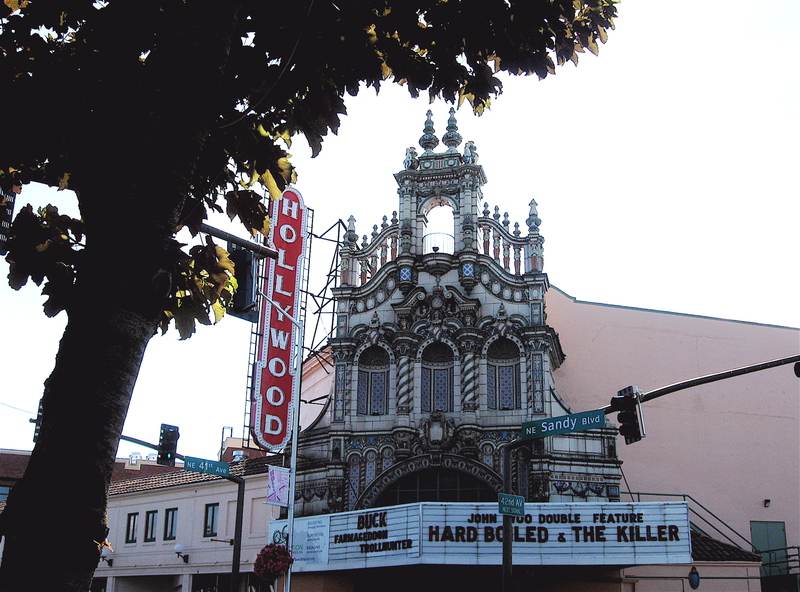 The upscale Hollywood neighborhood is part of the Irvington area and found within that section is the Hollywood Theater, a fully restored, 1920s gem. 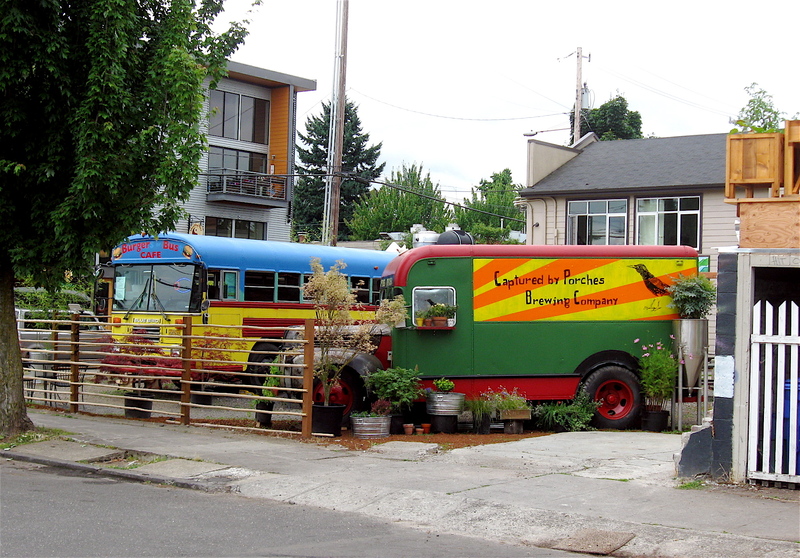 Another interesting area of the city I rode through was the Alberta Street neighborhood in Northwest Portland. It was once the center of the city’s African-American community. 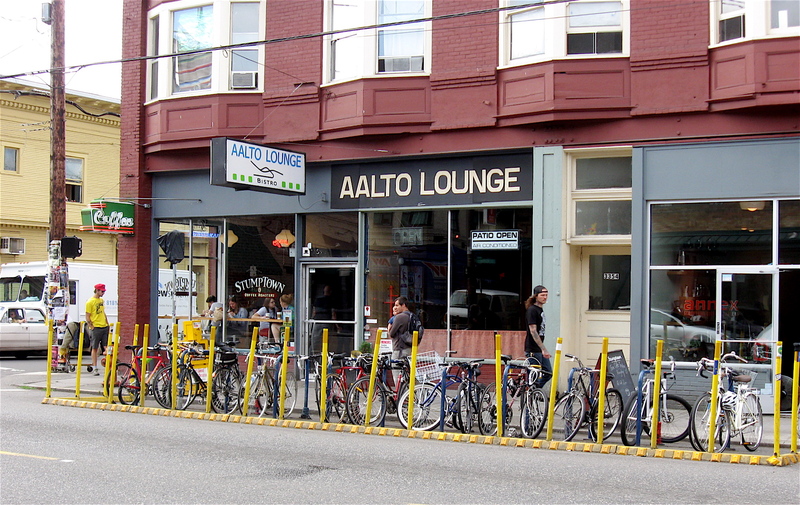 However, urban renewal programs have shifted a good part of that population into other areas of the city, and Alberta Street has now morphed into an upcoming arts and shopping district catering to artists and other subculture groups. Historic St Johns neighborhood is about seven miles north of downtown, and it reminded me of small town America. It had a quaint town square with streets of small, independent stores and modest wood frame homes. 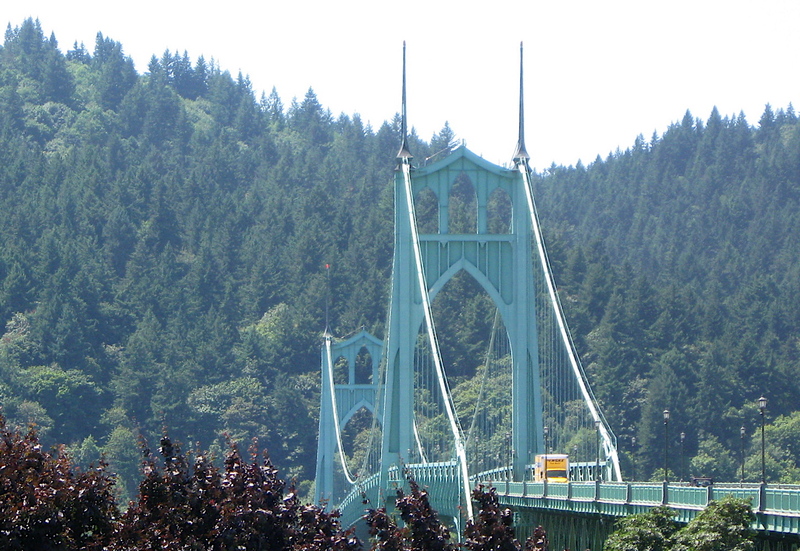 My ride out there took me across the expansive Saint Johns Bridge that was built in 1931. At that time, the Deco style bridge had the longest span of any bridge west of Detroit. It is the highest bridge I’ve ever ridden across. Just past the center, good judgment took over and I hopped off my bike and walked to the other end. At the time I was on that bridge, there was a tremendous amount of fast, heavy, truck traffic and the gusty tail winds they created were blowing me around. Since I wasn’t in the mood for a swan dive over the short railings into the river below, my two feet finished the trip across. The Hawthorne District in Southeast Portland is where I stayed. 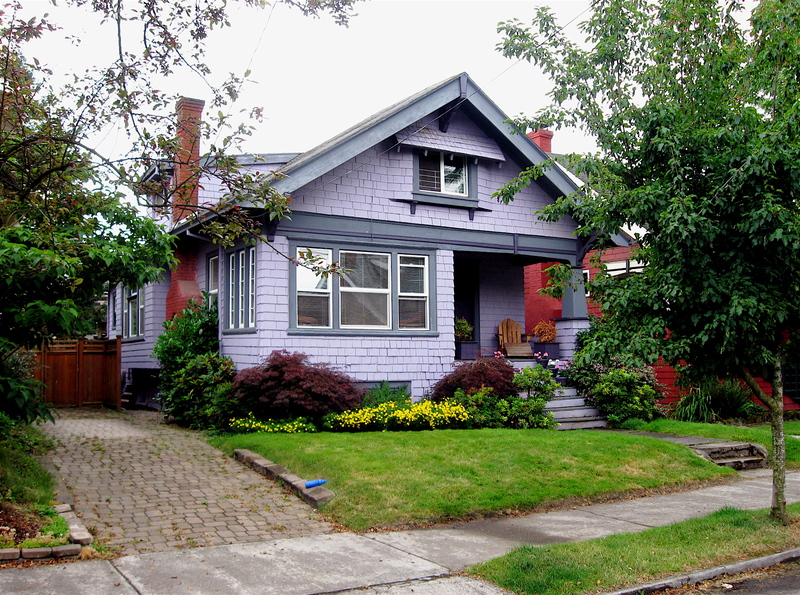 It’s a large area made up of various neighborhoods full of small, charming Craftsman Bungalows and other home styles, including a few from the Victorian era. 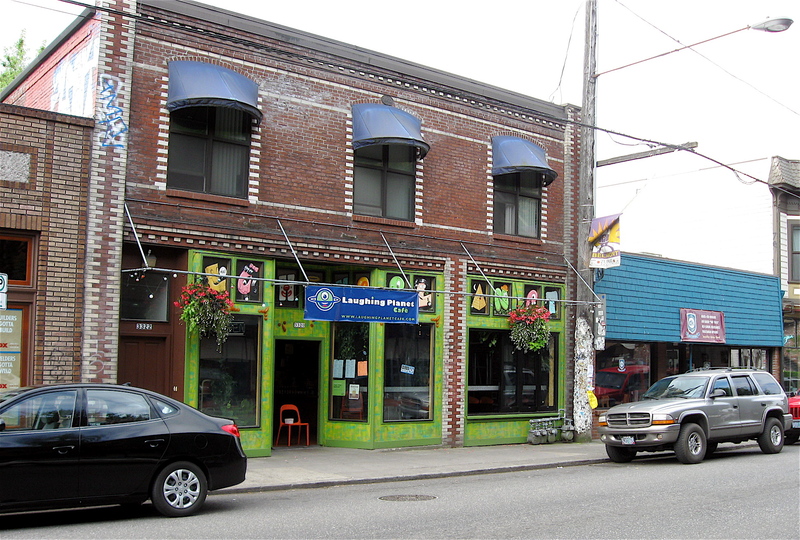 Hawthorne is a unique, quirky neighborhood with hundreds of businesses catering to the young people who have settled there. With so much variety, it’s a great neighborhood to explore on a bicycle. 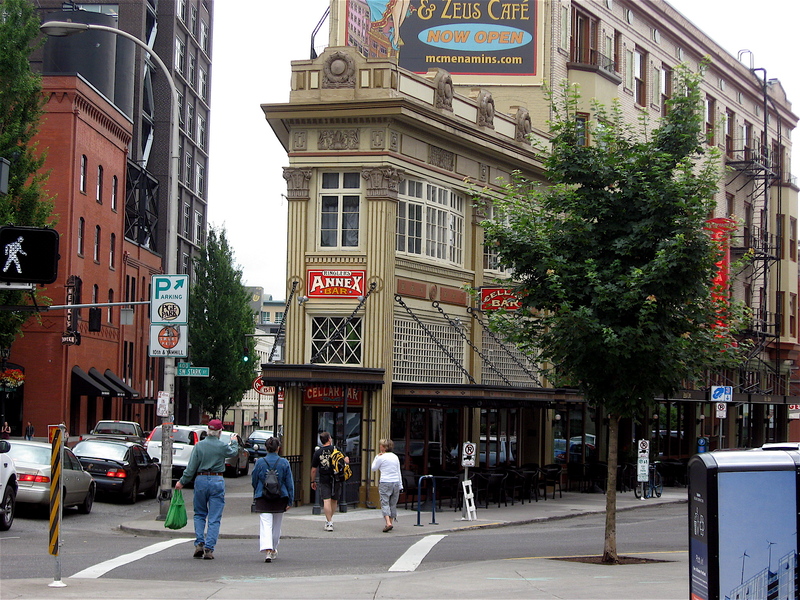 Like many cities, downtown Portland has a hip, trendy area called the Pearl District. It was once a light industrial/warehouse area and those buildings have been converted to pricy lofts, expensive restaurants and high-end specialty stores. In addition to many interesting neighborhoods, Portland is full of parks. The largest is Washington Park at 400 acres. 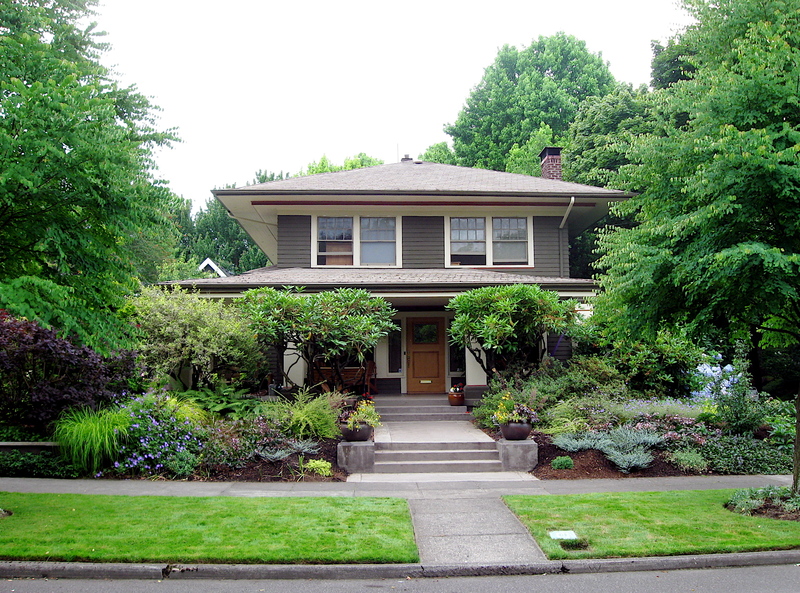 It is home to the Oregon Zoo, a Japanese Garden, tons of walking trails and other attractions. 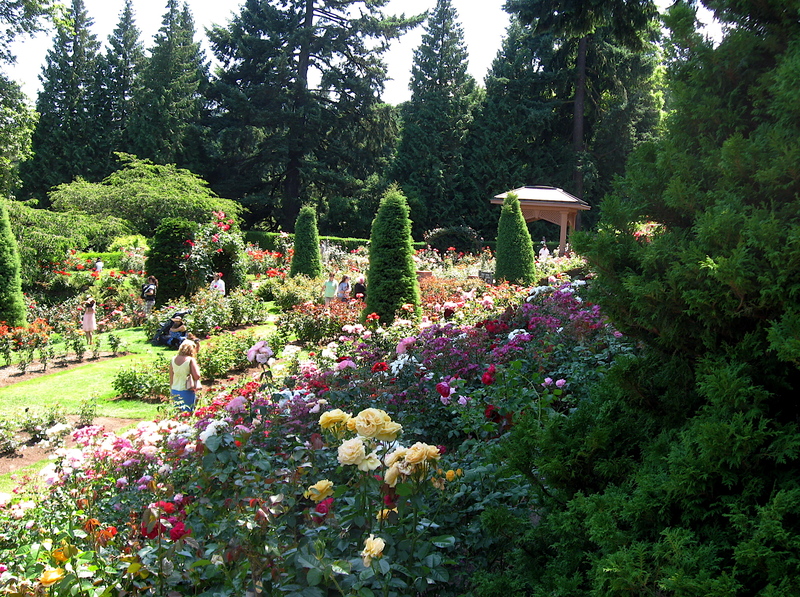 My favorite section was the Rose Garden. It featured over 7,000 bushes representing more than 550 varieties. The streets leading up to and the roads within the park were especially steep and winding. They reminded me of those found in San Francisco. It was a strenuous ride and pedaling there made me appreciate the seldom used low gears on the bike I was riding. Cycling up to that beautiful park to enjoy the gardens and views of the city was a fitting end to a few days of exploring Portland on two wheels. 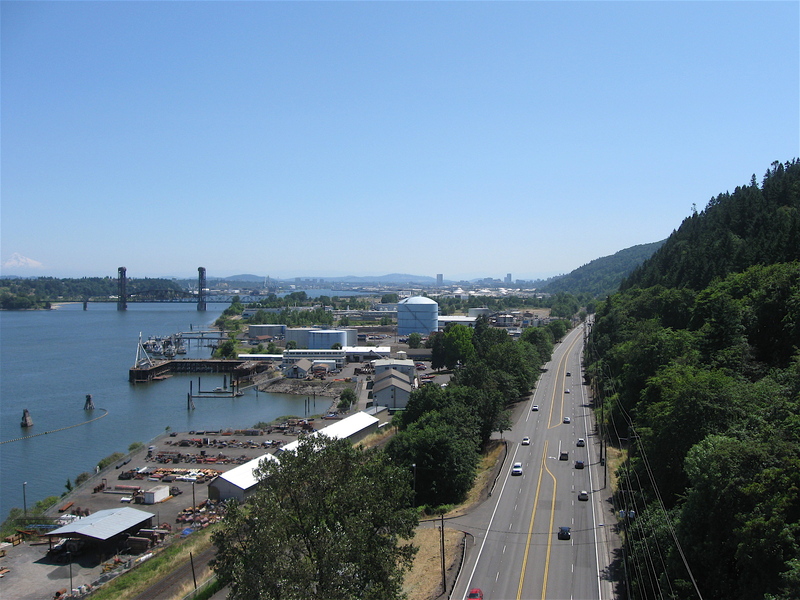 Last week I wrote about Portland, Oregon’s bicycle culture and how the city has embraced the bicycle mode of transportation by building many of their roads, streets and mass transit system with cyclists in mind. I mentioned there are about 46,000 daily bike commuters that travel along 325 well-marked bike paths and lanes. 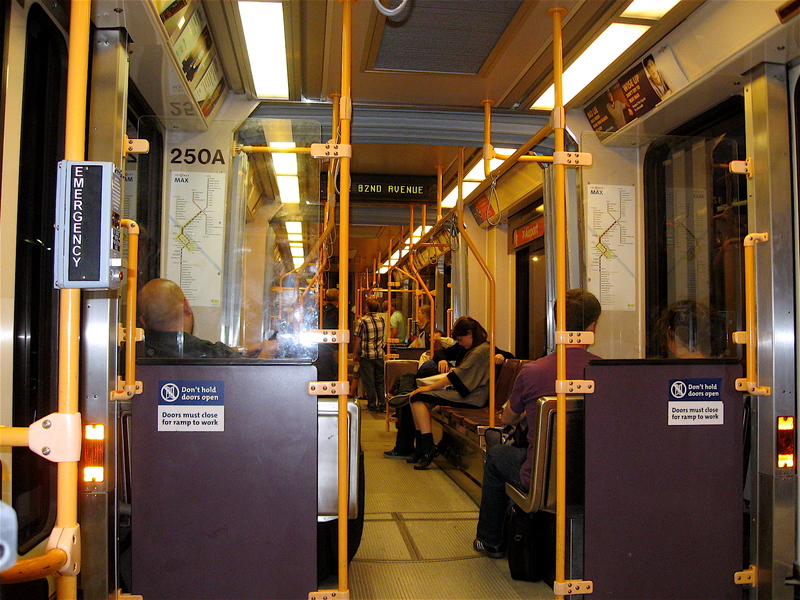 I also wrote about the hundreds of bicycle parking areas there and how the city’s mass transit system, called the TriMet, is well equipped to carry large numbers of bikes. While spending time in that city, I soon discovered that Portland is not only a city of bicycles, but it’s also a city of food carts, microbreweries, and coffee shops. 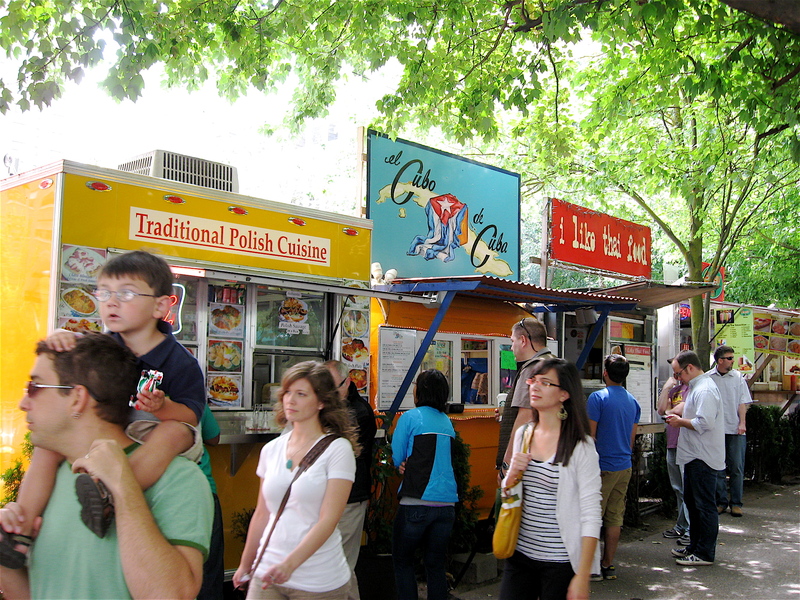 Food carts are big in Portland. Cycling throughout the city, I noticed many food carts scattered throughout the neighborhoods and in the downtown area. Basically, the food carts are delivery trucks and small pull-behind travel trailers that have been converted to mobile kitchens. Think of the taco trucks found throughout Southwest Detroit’s or one of the many ice cream trucks that cruise our own streets. 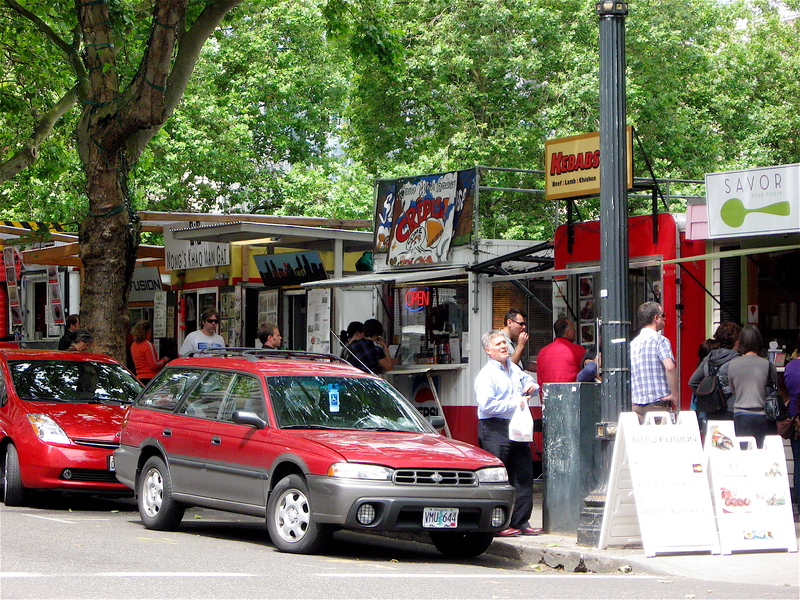 Portland’s food carts ring select parking lots facing the sidewalks in which they’re located. They are tightly packed next to each other, like books on a library shelf. They specialize in a variety of savory dishes that include Brazilian, Cuban, Thai, German, Mexican, Peruvian, Japanese Sushi, Polish, Scottish, traditional BBQ and other American and ethnic dishes. Their respective cuisine is offered at great prices with full lunches or dinners ranging from $5.00 to $10.00, quite a bargain and a daily stop for me. Portland is also a beer lover’s paradise with hundreds of microbreweries. From what I understand, Portland has more of them than any other city in the world. It is also home to the nation’s best-attended beer event, the Oregon Brewers Festival that was taking place while I was there, in the McCall Waterfront Park along the Willamette River in downtown. Not being much of a beer drinker, I was surprised at the amount of people I saw jammed into the Festival site on an early Thursday afternoon. 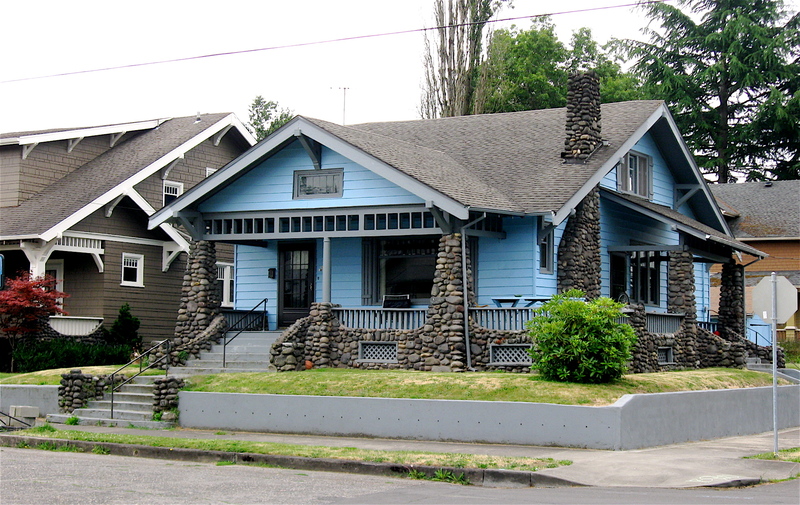 Many of the Portland neighborhood streets I rode reminded me of those found in San Francisco, Brooklyn and parts of Southwest Detroit. In addition to the countless microbreweries and food carts, there were bakeries, small grocery stores, fruit stands, vintage apparel shops, tattoo parlors, small café’s, pizzerias, specialty outfitters catering to outdoor enthusiasts and other specialty stores lining the streets. 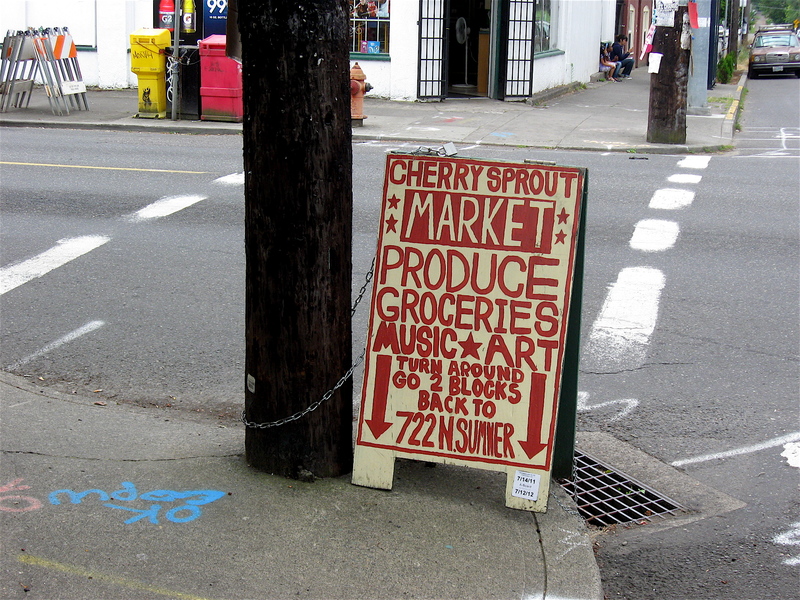 There is also a large concentration of independent coffee roasters and houses, catering to Portland’s predominately young population. I would be remiss if I didn’t mention Portland’s top tourist attraction. It isn’t the art museum, the Zoo or the breathtaking Washington Park area. 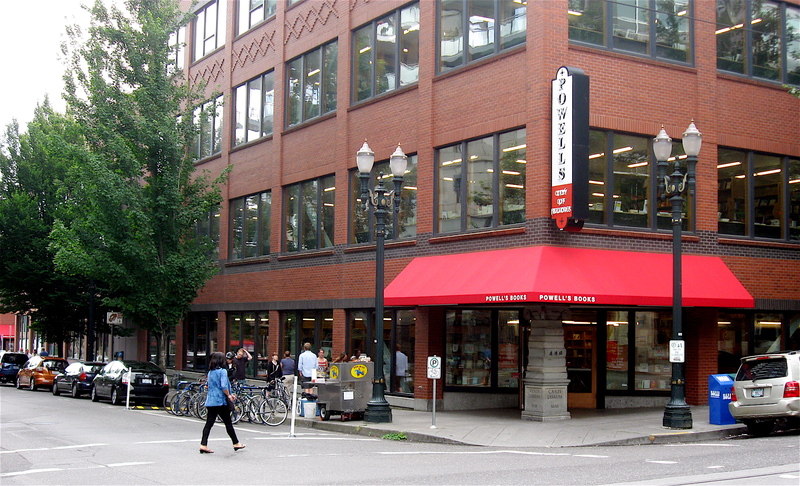 Surprisingly, it’s Powell’s Books. The bookstore is one of the largest in the world and stocks over 1 million titles spread over four floors. The store spans a full city block and the couple of times I was there, it was full of people browsing the long aisles. With a shrinking book industry (think Borders), it was good to see that Portland still had a viable bookseller doing a brisk business. 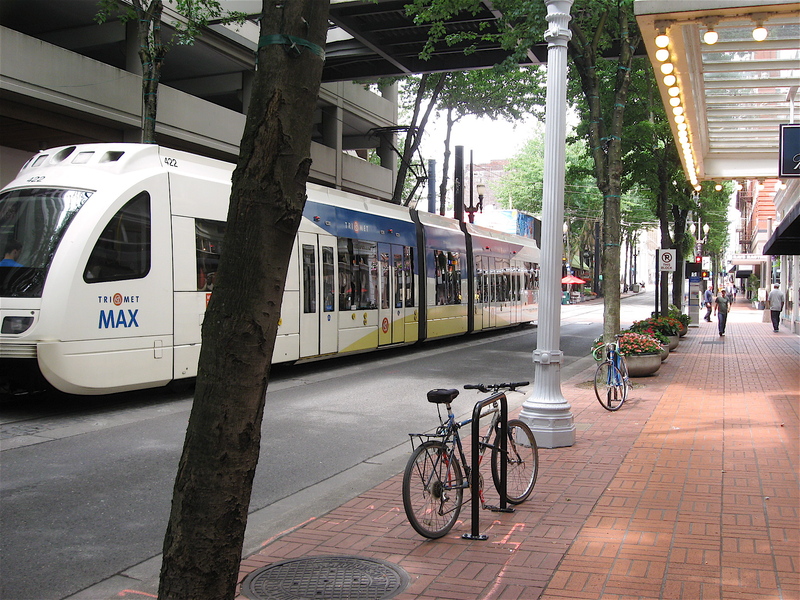 Portland, Oregon is one of the most bicycle friendly cities in America. I recently spent a few days out there exploring the city via bicycle and was amazed at the amount of cyclists I saw on the streets of that city. They seemed to be everywhere I rode: in the downtown area, the hilly, tree-lined neighborhoods, along the outlying commercial districts, at the airport, and throughout their many parks. With a population of about 580,000, it is estimated that at least eight percent of those living in Portland (close to 46,000) bicycle to work. 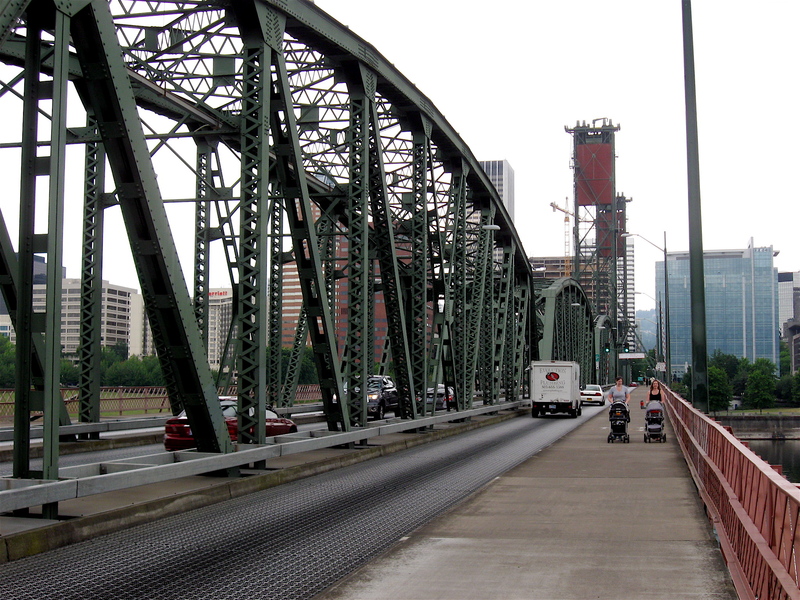 Five thousand bikes alone cross the 1,300-foot Hawthorne Bridge (one of half-dozen or so bridges spanning the Willamette River) into downtown Portland on a daily basis. That is a staggering amount of riders as compared to other major cities such as Detroit. Not only do people use bicycles to commute, many of the residents use them as their main form of transportation. Others use them for basic recreation, shopping, running errands or going out to dinner at one of the city’s many popular outdoor cafes that seemed to line the streets in just about every neighborhood I rode through. 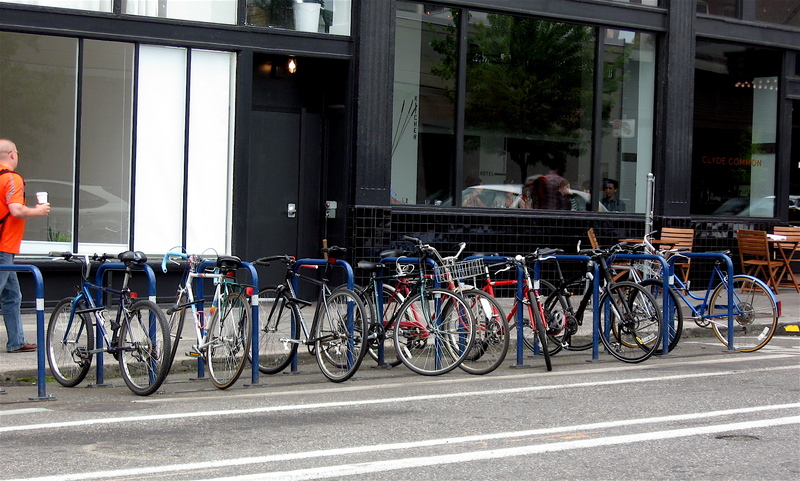 The city of Portland has embraced the bicycle culture in a big way. All through the city I saw hundreds of bike lots, U and Wave shaped street racks and other secure areas for bicycle use only. 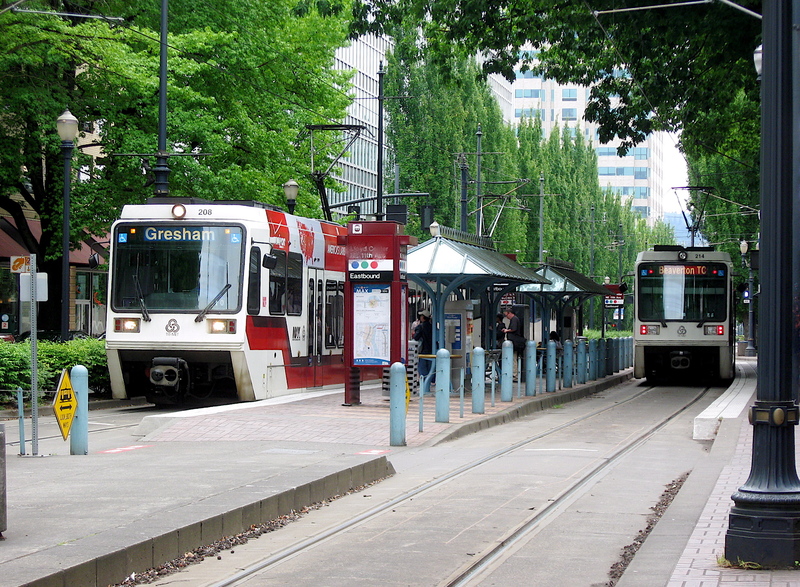 Even the city’s well designed, efficient mass transit system called the TriMet, (which includes a commuter and light rail system; streetcars and local buses that crisscross the city), are well equipped to carry thousands of bikes. There’s also a workstation located in the airport where people traveling with bicycles can easily assemble and dissemble their bikes before and after flights. As expected, the city has plenty of bike shops. 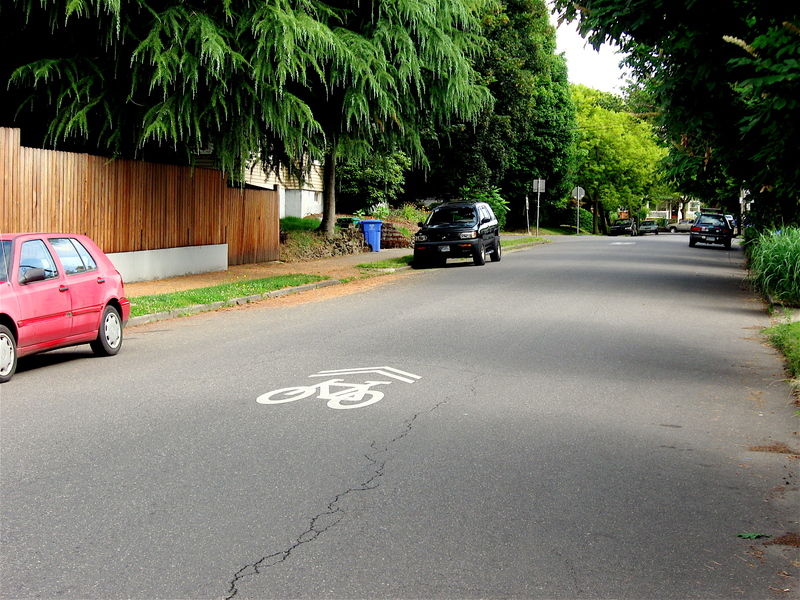 One of the best things I liked about cycling in Portland was the bike lanes. The city has something like 325 miles of bikeways. There are bicycle street graphics, directionals and wide, defined bike lanes incorporated onto the roadways. 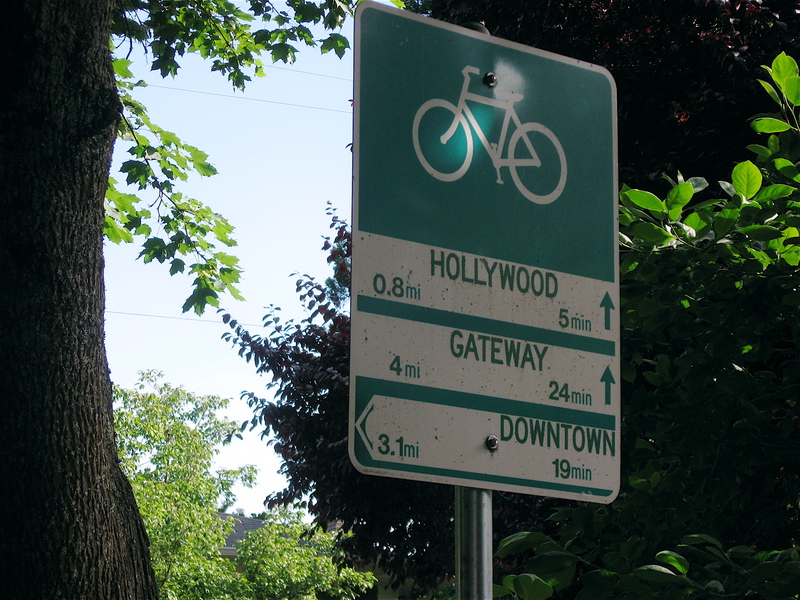 There are also cyclist’s street signs listing destinations, estimated biking time and distance to all major sections of the city and to local transit centers. Not all streets have bike lanes, especially some of the city’s busiest. But Portland planners came up with a very creative and safe alternative for cyclists wishing to travel along those roads. On the major streets without lanes, cyclists are directed through residential streets where well-marked bike routes parallel the high traffic street. Car and truck drivers are courteous and give plenty of room to riders zipping along the well-marked bike lanes. If no lanes are available, bicyclists hug the curb or pedal close to parked cars, and drivers wait for oncoming traffic to pass before they swing out to pass the cyclists. 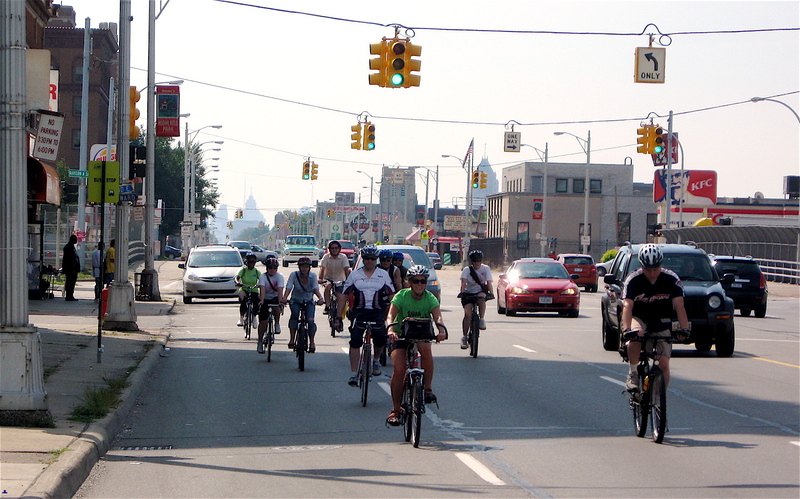 I was never beeped at or felt in any danger of being squeezed into parked cars or curbs like I have so many times while riding the streets of Detroit. 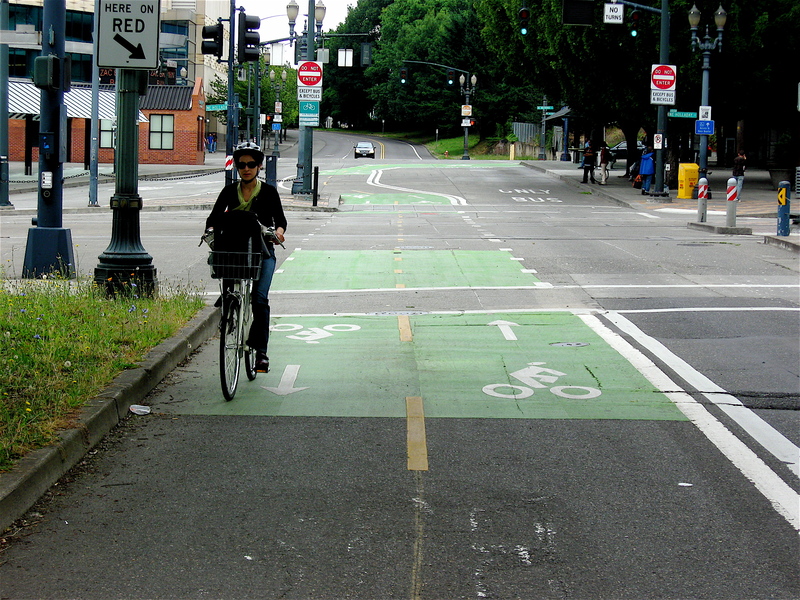 Portland is a great bicycle city, and other cities should look to their model when designing bicycle friendly streets. 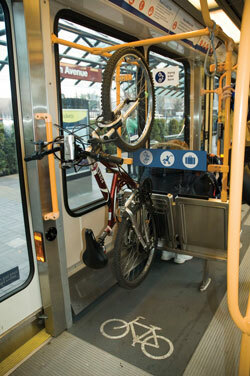 * Photo of bike on hook is from the TriMet website.